Nancy Leppink, Chief of the Labour Administration, Labour Inspection and Occupational Safety and Health Branch (LABADMIN/OSH) within the ILO’s Governance and Tripartism Department and former Administrator of DOL's Wage and Hour Division, explained how to improve protections for and the health of migrant workers. 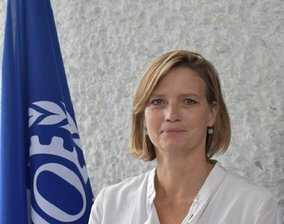 The ILO aims to promote decent work, meaning work that is safe and healthy and pays enough for workers to live decent lives, have security in the workplace, and enjoy social protections for their families. Almost half of the ILO’s conventions and recommendations deal with occupational safety and health, and the ILO provides technical advice and support to its member states on how to improve worker safety and health. 71 percent in services, including eight percent in domestic services. Migrant workers have twice the injury and fatality rates of native workers, and migrants are a large share of the 21 million workers in conditions of forced labor. Only 20 percent of migrant workers have full social protections at work, and only Thailand gives migrants the same access to health care as natives, although some migrants have difficulty navigating the Thai health system. The UN Sustainable Development Goals establish targets to be achieved by 2030, including to "protect labor rights and promote safe and secure working environments for all workers," with indicators published regularly to help citizens to assess progress. The ILO’s core conventions call for the elimination of child and forced labor and no discrimination, and other ILO conventions deal specifically with migrant and domestic workers. The WHO and IOM agreed in 2010 on a framework to monitor migrant health and to develop migrant-sensitive health care systems, and the ILO has taken the lead to protect migrant workers when they are recruited in their countries of origin.